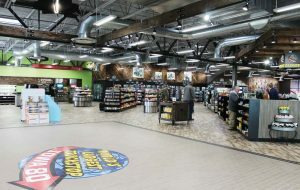 The owners recently installed a new entrance to the 130,000-square-foot main building of the Iowa 80 Truckstop complex. The place is big — really big. The main building of the Iowa 80 Truckstop in Walcott, Iowa, encompasses more square footage than a pair of football fields. The complex includes eight restaurants; a convenience store; gift shop; 30,000-square-foot “Super Truck” showroom; 60-seat movie theater; food court; trucker’s TV lounge; two dozen private showers; and a custom embroidery and vinyl shop. Dentists, chiropractors and barbers ply their respective trades at least six days a week in offices within the main building. A workout room and laundry facilities are also available. Meals are served around the clock. The Iowa 80 Kitchen, which seats 300 diners, dishes up more than 290 pounds of beef and 318 pounds of pork every day, seven days a week. 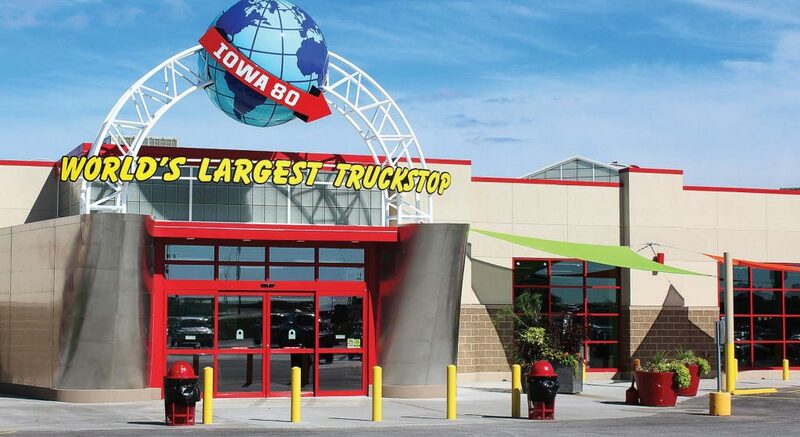 Other facilities include a seven-bay truck service center, three-bay truck wash, CAT scale, 10 gas islands, 16 diesel lanes, Dogomat pet wash and the Iowa 80 Trucking Museum. All told, Iowa 80 Truckstop maintains a workforce of approximately 500 employees to staff all three shifts. The parking lot itself is bigger than most truck stops. The asphalt expanse can accommodate 900 tractor-trailers, 250 cars and 20 buses. Iowa 80 serves 5,000 visitors a day, 45 percent of whom drive the big rigs. 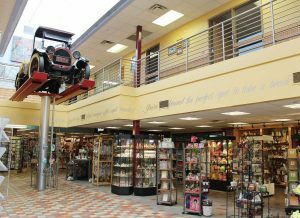 The “world’s largest and most respected truck stop” sits on 225 acres. The truck stop has undergone 28 expansions since it opened in a small white enamel building in 1964. Th e following year Manager Bill Moon and his wife, Carolyn, purchased the enterprise from Standard Oil, “leveraging everything they had, including borrowing money from friends,” according to www.iowa80truckstop.com. “Bill just loved everything about trucks and trucking,” said Carolyn. To put it mildly, mission accomplished, including 24-hour accessibility to its customers. “Iowa 80 opened in June 1964 and hasn’t closed its door since. That’s the equivalent of being open more than 473,040 consecutive hours,” said DeBaillie. The Moon family, now in its second generation of ownership, continues Bill’s legacy of honoring the industry with a museum and two annual events. 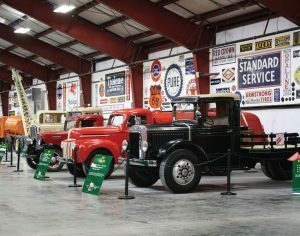 The museum contains more than 100 vintage trucks dating from 1910 to 1968. A vintage truck towers above patrons in the spacious main building of Iowa 80 Truckstop in Walcott. The 24-hour convenience store offers snacks and beverages as well as basic pet and camping supplies. The Iowa 80 Trucking Museum houses more than 100 antique trucks, at least one dating to 1910, with 60 on exhibit at any time. Also displayed are 304 original petroliana signs; 24 vintage gas pumps; and hundreds of other original artifacts, miniatures and truck-related toys. One item, a 1911 all-electric truck, was powered by 10 large wet cell batteries and was capable of traveling 50 miles on a single charge. The museum “is a great place for educators to enrich students’ learning,” touts the website, www.iowa80truckingmuseum.com, which includes teaching tools for kindergarten through fifth grade, a trucking vocabulary list and a variety of fun facts about the industry. The museum’s regular hours are 9 a.m. to 5 p.m. Wednesday through Saturday and noon to 5 p.m. Sunday. Summer hours from Memorial Day to Labor Day are 9 a.m. to 5 p.m. Monday through Saturday and noon to 5 p.m. Sunday. The museum is closed Easter, Thanksgiving, Christmas and New Year’s Day. Last year’s event drew a record 44,000 attendees. The 40th annual jamboree will take place July 11-13 2019. Every August the truck stop sponsors a tournament at nearby Glynn’s Creek Golf Course to benefit the trucking museum. The 16th annual tournament will be held Monday, Aug. 12 2019. The truck stop is located at 755 W. Iowa 80 Road, Exit 284, Walcott, Iowa. For more information, call (563) 284-6961.